It was to be a case of so far yet so near for Henselite UK sponsored player Greg Harlow in the recent Scottish International Open in Perth. 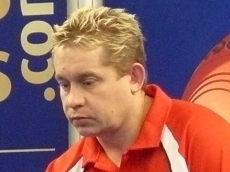 The 2010 World Champion was beaten by fellow Englishman Robert Paxton in a cracking final that was very much a game of two halves. Harlow started brilliantly and completely overwhelmed his opponent set winning 11-2. But a change of jack length tatic in the second set brought massive dividends for Paxton as he took complete control of proceedings and won the set 10-2 to take the final into a tie-break. It was Paxton who held his nerve to win the three end shoot out 2-1 and he became the first first qualifier to win the established World Bowls Tour title in Scotland. Sign up to our eNewsletter for all of the latest Hensilte news.